We’ve hit the end of another Assassin’s Creed era: Bloodline, the final episode of the Legacy of the First Blade, released this week, and it’s a true finisher. While we originally thought Legacy of the First Blade would closely follow Darius, the overall arc is more about life after all that. Your character learns to live with family, tending to a more domesticated existence than ever before. With a spouse and young child at home, the misthios must learn to balance between the life that brings them drachmae, and newfound peace and simplicity. As before, I’ll be speaking from the storypoint of Kassandra, with her spouse being Darius’ son Natakas. Elpidios is the name of their son, who is still a little babe at the start of Bloodline. And yes, thar be spoilers here-- it’s difficult to summate this story without some. Bloodline opens with a calm countryside-- Kassandra returns from a job, and is met by Darius. He reminds (warns?) her that her family needs her, and that she mustn’t forget what’s important in life. Your dialogue choice directs the action here; you can choose to remind him that living costs money, or you can assure him that your little family is important to you. Kassandra is a parent now. And she is muy relatable. The story moves on, showing a slowed pace as you spend time with your spouse, play with your child, and prepare for a good ol’ fashioned family meal to celebrate your return. That is, of course, when all hell breaks loose. Your village is ablaze. And standing at the middle of it all, is someone you deeply trusted and respected. An ally turns of yours out to be Amorgas, the head honcho hunting down Darius. But it isn’t enough to hunt Darius-- he has turned his sights to you, and your bloodline. The Order-- a portion revealed to be the famous Persian Immortals-- has come. In a moment of panic, Kassandra rushes home, insisting that Natakas and Elpidios make a break for the shore and an awaiting ship. Darius demands to stay behind, holding the Immortals off while they run. There’s a body on the beach… just one. A spouse murdered, and a child stolen. Left alone in the world, and in a most epic speech, Kassandra vows vengeance-- vengeance on anyone who will hear it, anyone involved. She swears to hunt the Order to the ends of the earth. This is what sets the stage for the finale of the DLC. The hunt is on: you’ll spend most of your time hunting down Order members, clawing your way towards their leader as you continue to upgrade your gear and refine your skills. There is a new move to add to your arsenal: Fury of the Bloodline, a flurry of powerful strikes that link your Isu blood to the Spear of Leonidas, filling your Adrenaline gauge while you get extra stabby. It’s not as spectacular when enemies are on their feet, but on a downed soldier? Oh yeah. When it’s all said and done, you come face-to-face with your betrayer-- with Darius’ betrayer. Amorges insists that his methods are just; that Kassandra is, in fact, the monster here, and that The Order has done everything in the name of peace. Because burning villages to the ground and slaughtering countless innocent people is totally a push for peace. Does that ring a bell? Templar propaganda, perhaps? Amorgas does swear to never harm Elpidios, ensuring that he’ll be safe as long as your character doesn’t raise him, or ever see him again. This is a move we’ve seen before; at the end of Black Flag, Edward Kenway is shown taking his family to the theater for a show. His young son, Haytham, begs for his father to lift him up to see the stage. Not long after this, Edward is murdered by a Templar (secretly, as he is one of the Kenway’s closest friends), and Haytham is raised by the Templar Order rather than the Assassin Brotherhood. Kidnapping kids and brainwashing them is the ultimate power move. This obviously doesn’t sit well with your character, and it becomes a fight to the death. Should you reign victorious, a cutscene ensues where Darius and his longtime brother/enemy come to terms, and allow Amorgas to die from his wounds rather than a swift death. But Amorgas’ words have hit at the core of your character; you know that The Order will forever hunt you and your blood. So, in a move that left me scratching my head somewhat, you leave the child in Darius’ care, swearing that your child will know that he was loved, that his parents fought- and one still fights- for him. And Bloodline ends with one super cool montage, linking Odyssey to Origins and the greater series as a whole. So, personal takes: I say I was confused and a little concerned that we leave the child with Darius. After all, Darius literally spent his whole child’s life running, the both of them forever escaping Amorgas and the Persian Order, after the rest of their family was killed off. I suppose, though, that with Amorgas gone, Darius’ pursuit will end? 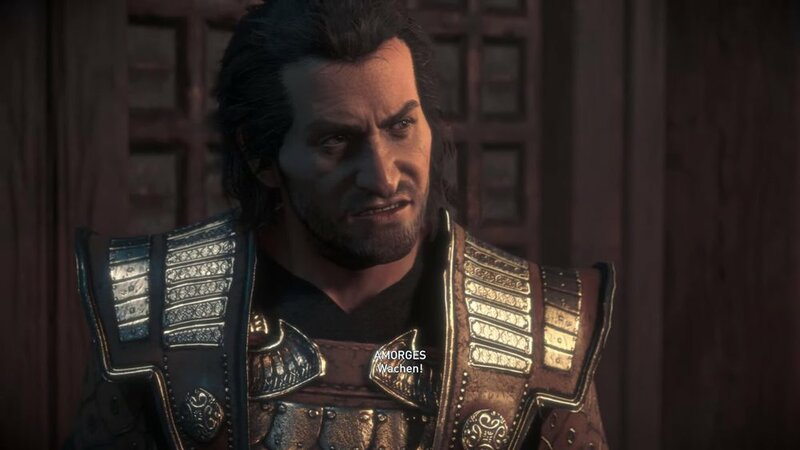 I guess it takes some heat off of Kassandra/Alexios, but it seems like they’d figure out the child was with Darius after a single encounter with our Tainted One. And our proto-Assassin is already old when we first meet him-- something shown in the final montage is that Elpidios is left alone fairly early on in his life, seemingly in his teenage years. 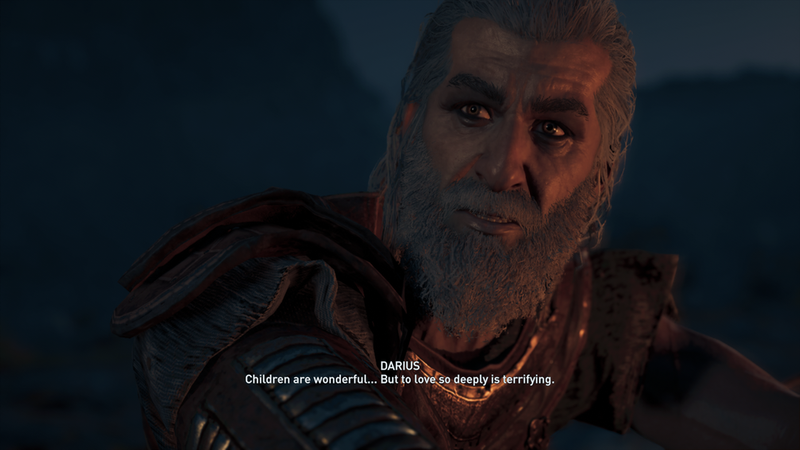 This breaks my heart as a parent, but I guess this isn’t too much of a surprise in The Way of Things in Assassin’s Creed. The ending tied so many threads together. I’m telling you: we’d really be missing out on a good chunk of story if this DLC didn’t exist. Dare I say, it should have been in the main game, but it plays into a later narrative, and Ubisoft already had so much to cover with the initial release. The character depicted as Elpidios’ descendant in the finale has (as with all things on the interwebs) drawn a weird amount of ire, with people insisting that it should have Been This Character Instead of That One, then the words “pandering” etc. were thrown around. As always. As the interwebs is wont to do. I don’t want to spoil who the character is, per se, but I will say this: if you think that pick is pandering, you haven’t been paying attention. We’ve known about this character since Assassin’s Creed II, we’ve met them in Origins. We know they’re special, and now we know where they came from. Graphics-wise, Bloodline was mostly up to par with its predecessors. I had a few weird lighting hiccups, wonky character faces and the like, but it mostly happened within the first 30 minutes or so, and then things smoothed back out. Overall, The Legacy of the First Blade is a welcome addition to a game that didn’t show its place in the Assassin’s Creed universe. As I mentioned in my original review of Odyssey, it was a cool game, full of stuff on stuff on stuff, but it didn’t seem to have the story to match. With Legacy and its episodes, we get a fuller arc of who our misthios is, where they’ve gone, and where they’re going, along with their place in the annals of Assassin history.